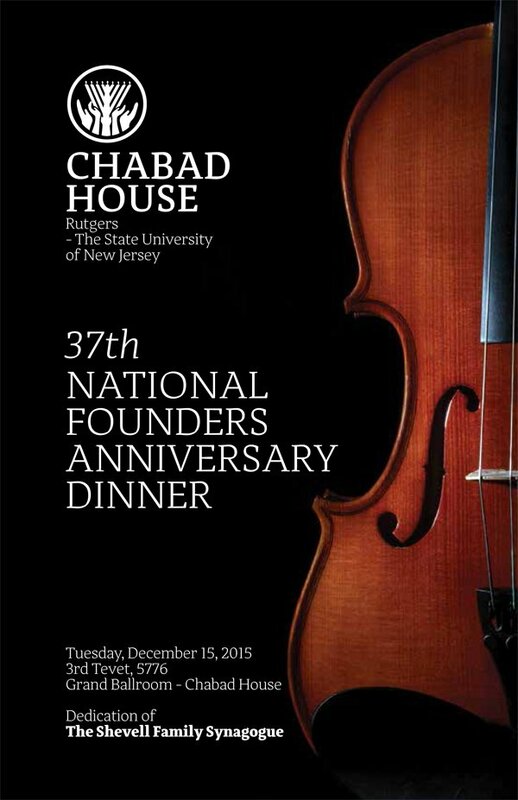 In a spirit of rejoicing and celebration, Chabad House Jewish Student Center at Rutgers University and its ten affiliate Chabad Houses serving central and southern New Jersey, will celebrate their National Founders Dinner at the Grand Ballroom of Chabad House, 170 College Avenue, New Brunswick, NJ, on Tuesday, December 15, 2015 at 6:00 PM. More than 600 community leaders and supporters are expected to pay tribute to the honoree, Mr. Myron P. “Mike” Shevell. 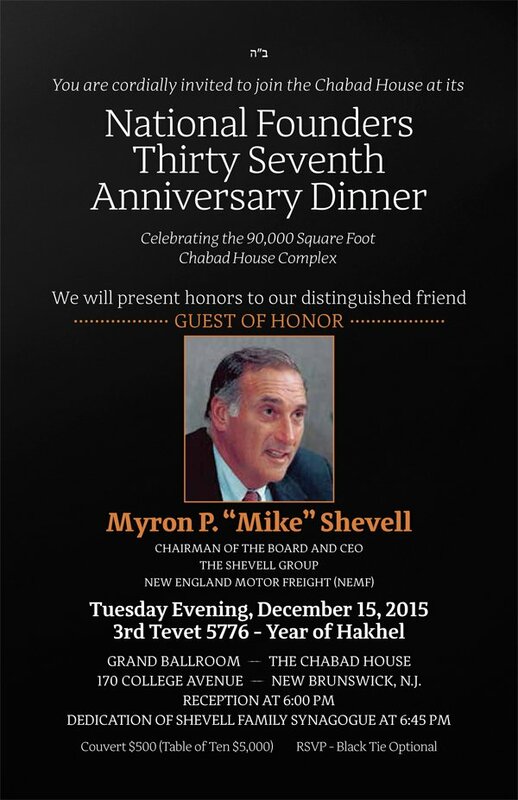 Mr. Shevell is Chairman of the Board and CEO of The Shevell Group, New England Motor Freight, and has been an active supporter of Chabad House for more than a decade. This gala dinner is celebrating the 37th Anniversary of Chabad House at Rutgers and the third year of operation of the 90,000 square foot mega Chabad House. This complex, features Housing Suites for 107 men and women, a Sephardic Synagogue, Judaica Library, International Coffee Shoppe, student lounges, computer areas, and a 750 person Kosher Dining Hall with enlarged Kitchens. Chabad House will also dedicate the “Shevell Family Synagogue” at this Gala Dinner, and the Dinner will also celebrate the Graduation of 30 Rutgers students who have successfully completed the “Jon Shevell Torah Study Program” at Chabad House. The Honorary Dinner Chairpersons include: Mr. Doron Cohen, Chairman, Dun & Bradstreet, (Israel) Ltd., Susan Shevell Cohen, NYC; Mr. Donald Epstein, CFO, Matrix Companies; Mr. Roger Fine, Vice President and General Counsel (Ret. ), Johnson & Johnson; Mr. Isaac S. Gindi, V.P., Century 21 Dept. Stores; Lita Greenberg, Highland Park; ; Mr. David Halpern, Atlantic Realty; Mr. Donald Hecht, Partner, Hecht & Co.; Mr. Michael Hecht, Partner, Hecht & Co.; Mr. Danny Kahane, Developer; Mr. Steven Katz, Partner, Sterling Properties Group; Amy B. Mansue, President and CEO, Children’s Specialized Hospital; Nancy Shevell McCartney, NYC; Mr. Ronald C. Rak, JD, CEO, St. Peter’s Healthcare System; Mr. Sammy Saka, Sakar International, Inc., Mr. Richard Saker, CEO and President of Saker ShopRites, Inc.; Mr. Rick Schottenfeld, Chairman, The Schottenfeld Group; Mr. Jeffries Shein, JGT Management; Mr. Ken Silverman, Chairman, The Silverman Group; Mr. Leonard Wilf, Garden Homes, Inc.; and Jerry Zaro, Esq., Sills, Cummis, and Gross. Rabbi Yosef Carlebach, Director of Chabad House, will report on the new complex and its outreach programs and activities this past year. Participants at the dinner will receive a special coffee table 37th Anniversary Album pictorially depicting the history of Chabad House from its first days in 1978, in a rented room at the Rutgers Student Center, to its location today as the largest Jewish Center on any public university campus in the world.